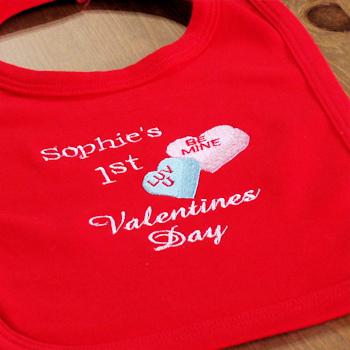 First Valentines red baby bib with love heart sweets embroidery and personalised with babies name in white thread. First Valentines red baby bib with love heart sweets embroidery and personalised with babies name in white thread. The bib is good quality made in the UK 100% double layer cotton pullover bib to help keep clothes dry and free from stains and is easy on and off pullover. Simply fill in the name you would like embroidered. First Valentines red baby bib with love heart sweets embroidery and personalised with babies name in white thread. The bib is good quality made in the UK 100% double layer cotton pullover bib to help keep clothes dry and free from stains and is easy on and off pullover. Simply fill in the name you would like embroidered. Valentines love heart sweets motif and 1st Valentines Day are embroidered, you tell us the name to add on top. Super cute Valentines gift for baby!